It’s probably not a big deal to most people out there, but it’s one box that’s missing from my collection. An open designed, collapsible plastic box, this bento box is designed specifically for sandwiches. â€¢ Pepper Spam Sandwiches, halved. The sandwiches had pan-fried pepper spam, romaine lettuce, tomatoes and jalapenos, with the bread spread with Kewpie mayonnaise. â€¢ Half a Nutella & Mango sandwich. Instead of making one whole sandwich and cutting it in half, I only prepared half a sandwich. I took one slice, then halved it. I then proceeded to spread both sides with Nutella then added mango strips. Yummy idea, yes? â€¢ Apple wedges. To prevent the apples from browning, brush them with lemon juice or dip in a cup of lemon water. Lemon juice is more effective in slowing down the oxidation but leaves a lemony taste. Lemon water browns eventually but you can barely detect the taste. â€¢ Chocolate Mallows. Another childhood favorite, chocolate mallows is a big marshmallow stuck on top of a biscuit then covered in chocolate. 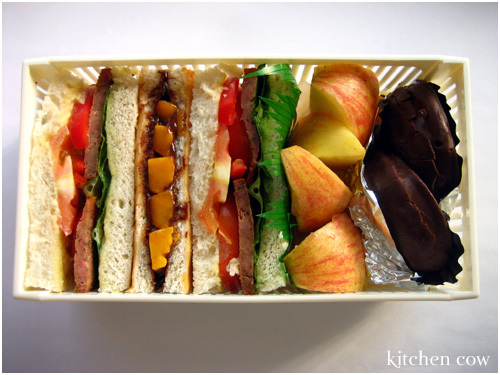 Wonder how to place those seemingly perfect sandwich halves in bento boxes? I used to have a hard time doing that with my other sandwich box, but with this new one, it’s so easy. Just stick it on its side! That way, you can just pile the sandwich halves on each other. Afterwards, hold on to it as you put it right side up, then release only when you’ve placed your other bento stuffers in. Easy peasy! A nice box to have in any bento collection. The open vents prevent condensation from forming in your box so you don’t have to worry about soggy sandwiches. All sides are open though, so I opted to line the bottom of mine with wax paper since I was worried about the tomatoes dripping on my other stuff. The side is a bit narrow for ordinary loaf bread so I had to trim an itty bit to make it fit. Also, other stuff you’ll keep with your sandwich has to be taken in consideration. If you want to collapse it after lunch, you’ll have to make sure not to use cup-style dividers and stick to baran or paper cups instead. The folding mechanism is very simple, so no headaches there. Of course, I worry that it might wear out in the future but then, for 88PHP, it’s more than worth it. This entry was posted in bento, bento box review, take a tip. Bookmark the permalink. That’s a nifty contraption right there! And you got it at the P88 store? I love that shop!! So many cute finds there. What a cool gadget! We wantssss it!!! I labs it! And for the el cheapo price, I say it’s a must for every kitchen. While it’s marketed as a sandwich case, I think it could be used for practically any thing–except maybe soup 😛 It would be perfect for stuffing fragile food like fruit in your bag or lumpia take-out or cookies or bags of chips that can get smushed around in your purse. Oooh that’s a very cool box! But I don’t like how it’s open hmmm. I miss Daiso. I have to check that store again soon. p.s. Nutella and mangoes? That’s an idea! The nutella was a bit too much applied on both sides. Next time, I’ll either apply on one side, or apply less. And more mangoes, bwahahahaha. I’m probably just addicted to mangoes. About the box being open, I don’t mind it since I usually slip it inside a kinchaku anyway. Or in this case, a plastic bag, before I slipped it inside my big bag. Hmm… I think the link that I put in the URI is the cause. i’m browsing your bento creations and will soon have raging hunger pangs by lunchtime. I love all your food inventions (imBENTO?) and the time you take to document and blog about it. I’m trying to choose a favorite but then it is quite difficult. nutella and mango! wat a combo!! mmmmm but I love your spam sandwich idea, I am a huge chili head and when I read jalapeno I thought, why have I never done that!?!?!?! Spam.. everyone talks about it |DD;; I think I might have to try it..
oh my! how interesting that bento box. but does it have a cover? you should have taken a picture of the collapsed form of the sandwich box. hehe! Winner combo 😀 I actually got the idea from a crepe I tasted at one of the bistros here. It was a mango crepe with a thin spreading of nutella. Since I loved it, I wondered if it would translate well into a sandwich. Jalapenos! I like the chili taste it adds because it’s a light Jalapeno taste that doesn’t overpower the whole thing with spiciness. I’d love to try a Jalapeno and cream cheese sandwich sometime though. I hear Nutella’s great with bananas too 😀 And our Mallows don’t have jam. Interesting addition, methinks though. A fruit-flavor would cut the sweetness well. It does 😀 Actually, I was planning to include a photo of the box assembled and collapsed but I didn’t have the time. I’ll edit the post as soon as I get the shot though. eyelovett! and the price isn’t bad at all! i keep hearing about great finds from that place. maaaaaan. Don’t you have a Daiso nearby? I know there’s a branch in Daly City. My aunt went nuts shopping for bento supplies for me there. But then, Philippine prices are still a tad cheaper. I’d like to try Nutella and mango! I always eat nutella and banana on whole wheat during my FFXII days (it feels like high-energy travelling grub to me) but I’ve never tried mangoes. Here goes! hello. am not a friend of clair twas just a spur of the moment word that came to mind. I found the boxes! I got two, both from Japan Home Center in MarketMarket, one had a solid lid, the other one I haven’t checkd out yet. But so cute!!!! Yosha! Methinks I should go visit them this week too, my mom’s officemate wants egg molds too, heehee. What shapes did you get? They only had the heart/star mold set. P60! I plan to get another set since I want to make lotsa pink hearts. HEART & STAR? WAAAAI! I don’t have that yet. Must get another! Hahahaha, my bear & bunny set get minimal action and here I want another set. Gawd bento has definitely ruined my brain. Again, thanks for the heads up. Must go to Hatchin this week. I check the pic and my eyes immediately zoomed out on the Choco Mallows. HAHAHA. My all-time favorite. I used to put them on the fridge and eat them when the coating is frosted. Or have them heated until the choco melts and I have to lick them off the foil. Sorry, I just have the craziest childhood eating habits. And errr, I’m gonna look for a collapsible sandwich case at Japan Home Center in Robinson’s Place. I love chocolate mallows best when they’re fresh from the fridge too! Mmm… I made a mistake of sticking them in the freezer once and maaan! Bato, hahahahaha!